Here at Yorkshiremillshops we offer a Bespoke service from a range of quality fabrics in both Egyptian cotton and Easy Care Poly/cotton. We do not carry and readymade items. Everything is in fabric form, waiting to be individually cut and made to customer’s requirements. In Egyptian cotton we offer a 200 thread count Plain weave, had wearing, superior handle in White and Cream only. We also offer a 400 and 500 thread Egyptian Cotton Sateen, luxury finish and handle. Our standard 100% cotton fabric is an excellent quality, hard wearing and available in a range of colours. In Poly/cotton we offer 180 Thread Percale, easy care, smooth handle, in a range of colours and our 150 thread easy care Smooth Poly/cotton in a large range of colours. In addition we offer made to measure quilts in Feather/Down, Duck Down and Hollofibre as well as quilt/duvet covers,a range of mattress covers,Valances & pillowcases, all bespoke for you. However big your bed we can make you an extra large fitted sheet to fit. Photo courtesy of Revival Beds. Whatever shape your bed we can make you a sheet to fit. Round Bed sheets are our speciality. Finding bedding especially Valance for Electric Beds is not easy however Electric Bed Sheets and Bedding are our speciality. What ever Special Size Bed Sheet you want we can make it. 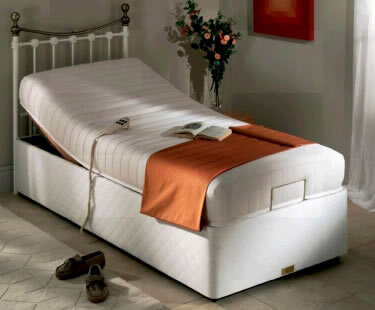 Photo courtesy of The Antique Bed Co.
Electric beds are now available in a choice of beds from 75cm wide single mattress,up to 200cm wide(6’ 6”)bed with two separate mattresses, both electrically adjustable. This means that you can sit up in bed at the touch of a button, read the paper, have a coffee, watch the TV (with the sound suitably muted) without disturbing your partner. The trouble is the standard fitted sheets will not stay in place when the mattress is moved. They were never designed to. To get over this problem, our sheets are tailored to accommodate the movement and yet remain in place. The price of the fitted sheet is no different to a normal bed, however you must mention that it is for an Adjustable bed so that we can tailor it accordingly. The same tailoring is required for mattress covers and valances, everything made to measure. With the correct valance, the lifting mechanism is hidden even when the mattress is tilted upwards. We offer a choice of valance, depending on your bed. The most popular base valance is made with Velcro attached to enable fixing to the base. You can also have the valance attached to the top of the fitted sheet allowing it to rise of fall with the movement of the bed.